When we revamped this website, one of the casualties was Earlier Blogs. In the web developers opinion, there was no point in keeping them if they were more than a year old. 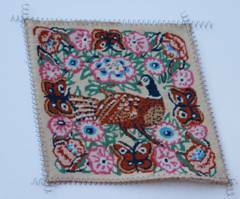 He was right in most cases, but this one I thought I would repeat as it shows what can be done when you think your tapestry cushions are beyond their useful life. This was originally posted in April 2010. 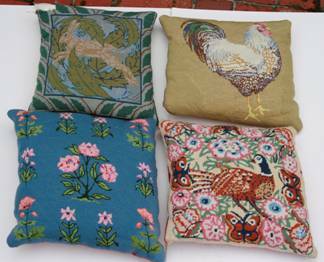 Recently, a friend entrusted me with some tapestry cushions stitched and made by her late mother. 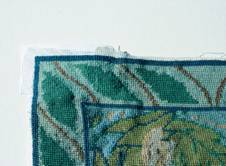 The tapestries had never been stretched and were all quite badly out of shape. One even had a whole corner completely missing thanks to my friend’s new puppy! 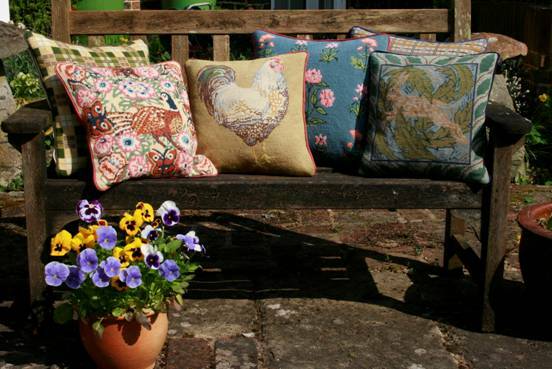 My job was to straighten them out and make them into new cushions. There were six altogether. Here are four of them. I needed to unpick all the tapestries from the backings ready for stretching. But first there was the missing corner to put right. I knew how to do it in theory but never actually braved it before – it just seemed so worth having a go this time. In the end, it really wasn’t difficult. First I unpicked some of the ragged stitching till I had some clear OLD canvas. Then I could pin a new piece of canvas to the back and line up the holes with the old. 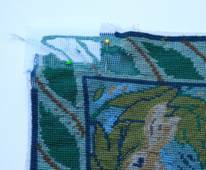 I matched the colours as near as I could and then began stitching through both old and new canvas to anchor the patch and then just carried on until the whole corner was complete. Next, all the canvases had to be stretched. To do this, I wind wire spirals into the edges and rig them up on this instrument of torture – the Stretching Frame. 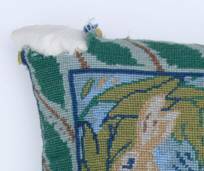 Because they had been made up, nearly all the spare canvas round the stitching had been trimmed and mitred!! Tricky. Finally, they get thoroughly wetted and left to dry in the fresh air. Now it’s off to the cushion lady with armfuls of fabrics and zips. Well, I forgot the zips and had to do a return trip! 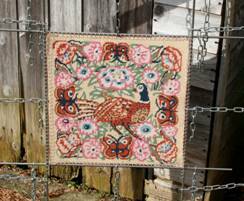 …Lovely square, plump cushions to remind my friend of her mother’s needlepoint skills for years to come.